Bad news for BT today. Ofcom confirms that it has been unable to reach a voluntary agreement over the future of Openreach and would now force the operator to adopt “legal separation“. A new UK framework for the next decade of telecoms and broadband regulation will now be established. Openreach is responsible for managing access to and upgrading BT’s national telecoms and broadband network, which they’ve been required to do on a “functionally separate” basis since the last review in 2005. The outcome of that review loosened BT’s control and fuelled the rise of ISPs like Sky Broadband, TalkTalk and many others, which also made related services cheaper. Ofcom also appeared to support the view of a cross-party inquiry (here), which claimed that BT has been under-investing in its network by “hundreds of millions of pounds.” BT denied that accusation and pointed to their plan for deploying 300Mbps G.fast broadband to 10 million UK premises by 2020, with “most of the UK” likely to be done by 2025. On top of that BT aims to roll-out 1Gbps FTTP to 2 million UK premises by 2020 and the operator hopes to invest £6bn over the next three years, although this includes their vast mobile business under EE and that covers a lot of existing commitments. However BT’s critics want to see significantly more FTTP and less hybrid-fibre G.fast. The new agreement therefore hopes to find a way forward by giving rivals easier access to BT’s national network of cable ducts and poles (details), as well as a more independent governance structure for Openreach, tougher minimum service quality standards, new consumer protection measures and better information sharing. Our proposal requires Openreach to become a distinct company with its own Board. This would comprise a majority of non-executive directors, including the Chair, who are not affiliated with BT. Openreach would be guaranteed greater independence to make decisions on strategic investments, with a duty to treat all of its customers equally. We are now preparing to notify the European Commission of our intention to implement these plans, requiring the legal separation of Openreach to make it more independent. Throughout this process, we remain open to BT bridging the gap between its proposal and what is required to address our strong competition concerns. Around 94,000 people responded to our consultation via an online campaign. Some 90,000 of these were identical responses written by the [Fix Britain’s Internet] campaign, calling for action to improve the UK’s telecoms infrastructure; including the full, structural separation of BT. A few responses shared positive experiences of BT and urged no further action. A significant number of the 4,000 non-standard responses raised concerns about slow broadband speeds, the availability of fibre broadband and the quality of service from major service providers. Most concerns related to BT, with a smaller number of complaints about other providers including Sky Broadband, TalkTalk and Virgin Media. One of the biggest stumbling blocks to a voluntary agreement has stemmed from Ofcom’s call for Openreach to “become a ring-fenced, ‘wholly-owned subsidiary’ of BT Group, with its own purpose and board members.” As part of that they also wanted Openreach to be allowed to have confidential discussions with its customers (i.e. without oversight by BT). However BT has been bitterly opposed to Openreach becoming a “legally separate company” (no CEO likes to lose full control over part of their business, even if the BT board would still have a say). Furthermore BT also complained about the related risks and costs of moving staff and pension liabilities to the “new” company. In the end Ofcom has forced through “legal separation“, which is not the nuclear option of full structural separation that many of BT’s rivals had been demanding. Ofcom sees their approach as being able to deliver all of the benefits that stem from full separation, albeit without many of the complexities and costs. “Structural separation could generate materially greater costs and risks compared to models based on legal separation. This includes the costs of physically separating the two businesses, and effects on the BT pension scheme,” said Ofcom. However most stakeholders who responded to their consultation felt as if BT had “overstated” the impact on their pension scheme. We have continued to discuss with BT potential changes to its voluntary proposal. Although we have made some progress, BT has so far failed to offer proposals that would adequately address our concerns. BT’s proposals still fall short in important areas. These include the transfer of people and assets, and the level of influence that BT Group executives could exert over the management of Openreach. Our current view is still that an effective and robust form of legal separation, with Openreach as a wholly-owned subsidiary of BT, is likely to achieve the greatest improvements for everyone in the shortest amount of time. Therefore, this is the approach with which we are minded to proceed. Our model will include proposals to publicly scrutinise and monitor its effectiveness against several measures of success. The most direct will be whether Openreach Board decisions are taken independently, without undue influence from BT Group. If Ofcom’s monitoring suggests that legal separation is not delivering sufficient benefits for the wider telecoms industry and its customers, we will return to the question of structural separation – fully breaking up the companies. As an operator BT has always faced somewhat of a conflict between public expectation and investment reality. On the one hand they are of course a commercial company, not a charity, and one that quite understandably must take account of what shareholders and the business case deem to be the best course of action for their bottom line. On the other hand BT’s private interests often seem to have become increasingly different from what the public and cross-party MPs expect. A large part of this divide could perhaps be expressed as both a product of historic regulation and key political decisions, not least former PM Margaret Thatcher‘s move in 1991 to stall BT’s early fibre optic roll-out due to competition concerns. Another problem is that new services (e.g. ultrafast broadband) cost more to deliver and it can sometimes be difficult to get people to pay the extra for those when we all exist in an aggressively competitive market, one where consumers expect to get a fast and good quality Internet connection for very little money; today’s deal probably won’t change that reality. Ofcom will thus be hoping that their changes are just enough to redress the balance by boosting competition, accountability and service quality, albeit without completely turning the market on its head. Suffice to say that we might well be back to this same question again in another 10 years’ time, but a lot can happen in a decade. In the meantime Ofcom said that they “remain open to further voluntary proposals from BT” to address their outstanding concerns, but were pressing forwards regardless and expect to consult publicly on a submission to the European Commission during early 2017. “We note Ofcom’s announcement this morning, updating on the next steps of the Digital Communications Review. We put forward proposals in July that we believe are fair and sustainable, and that meet Ofcom’s objectives without disproportionate costs. We are implementing these proposals, and have just appointed Mike McTighe to be the first chairman of Openreach. We are in discussions with Ofcom on two outstanding issues, the reporting line of the Openreach CEO and the form of legal incorporation. It’s no coincidence that Openreach has today appointed Mike McTighe to be its first ever Chairman. BT said that McTighe, who will take up his role from January 2017, is an “experienced telecoms executive and regulator who spent eight years on the Board of Ofcom“. He will oversee the new Openreach Board, which will operate from early 2017, and be “instrumental in selecting further independent members to join that Board“. But Openreach knows that it will soon have to go a lot further. “I am delighted that Mike has agreed to be the first Chairman of Openreach. He has extensive experience and I am sure Openreach will benefit from his detailed industry and regulatory knowledge. We should add that the Strategic Review also covered a number of other service improvement proposals, such as the push for a new “automatic compensation” requirement when consumers suffer a fault that causes a “loss or reduction of service” and we must not forget the forthcoming 10Mbps Universal Service Obligation (USO). Many of these service improvement measures are being defined and consulted upon as part of the wider Digital Economy Bill 2016-17. We’d argue that these will probably have a much more obvious impact upon consumers than the above decision. Ofcom is effectively trying to help the market to become more competitive and fair, but this will take many years to foster and won’t be something that is immediately apparent to most end-users. Now here’s a quick recap of Ofcom’s original proposals and you can also read the latest UPDATE NOTE on their website. Comments from ISPs are at the bottom of this article. * Openreach will be required to give rival ISPs easier access to their national network of telegraph poles and cable ducts, which can be used to install faster broadband services. The Duct and Pole Access (DPA) solution is effectively an enhanced and more flexible version of their old Physical Infrastructure Access (PIA) product. As part of this Openreach must provide comprehensive data on the nature and location of its ducts and poles. * Tougher minimum service requirements, which aim to push Openreach into repairing faults and installing new lines / services more quickly. Ofcom will monitor and report on related progress. * Openreach’s governance structure will be overhauled so that the operator can take its own decisions on budget, investment and strategy. The new management will be required to “serve all wholesale customers equally, and consult them on its investment plans“. This includes greater transparency over how costs and assets are allocated between Openreach and the rest of BT. * Openreach to become a distinct company. Openreach should be a legally separate company within BT Group, with its own ‘Articles of Association’. Openreach – and its directors – would be required to make decisions in the interests of all Openreach’s customers, and to promote the success of the company. * Openreach to have its own Board. The new Board should have a majority of non-executive directors, including the Chair. These non-executives should not be affiliated to BT Group in any way, but would be both appointed and removed by BT in consultation with Ofcom. * Executives accountable to the new Board. Openreach’s Chief Executive should be appointed by, and accountable to, the Openreach Board – not BT Group. The Chief Executive would then be responsible for other executive appointments. There should be no direct lines of reporting from Openreach executives to BT Group, unless agreed by exception with Ofcom. * Greater consultation with customers. Openreach would be obliged to consult formally with customers such as Sky and TalkTalk on large-scale investments. There should be a ‘confidential’ phase during which customers can discuss ideas without this being disclosed to BT Group. * Staff to work for Openreach. Ofcom’s principle for the new model is that people who work for Openreach should be employees of the new company, rather than BT Group. This would prevent any real or perceived conflict of interest, and allow Openreach to develop its own distinct organisational culture. * Openreach to own assets that it already controls. Openreach should own its physical network. This would allow the Openreach Board to make decisions that depend on investing in, and looking after, Openreach’s assets. There may be costs in transferring assets or people to Openreach, which would need to be mitigated. * A separate strategy and control over budget allocation. Openreach should develop its own strategy and annual operating plans, within an overall budget set by BT Group. Openreach should have its own brand, not affiliated with BT Group, to help embed the organisational culture of a distinct company. Added a comment from BT above. Now it’s TalkTalk’s turn to comment. “Openreach has been letting consumers down for far too long, unable to meet promises of even minor improvements and becoming a household name for all the wrong reasons. However, we welcome the fact that the regulator has finally made a decision, and while we do not think legal separation goes far enough to deliver the broadband consumers deserve, they are at least a step in the right direction. “This announcement will undoubtedly come as a blow to BT, which thought it was making progress with Ofcom; however, the door remains open for both sides to reach a voluntary agreement. In many ways, a voluntary agreement remains a better outcome than a forced legal separation, not least because the EU route is uncertain, untested, and likely to take much longer to achieve. It is also made more complex by the decision from the UK to leave the EU. In the summer of 2016, BT and Ofcom appeared to be close to reaching an agreement. Today, it is clear that the issues around the transfer of people and assets, and the level of influence that BT Group executives could exert over the management of Openreach remain sticking points, including complex issues surrounding BT’s pension scheme. These will be the areas that BT needs to focus on to avoid the imposed legal separation Ofcom stands ready to implement. Telecoms operator Vodafone has chimed in to claim in a new report that BT’s “excess profits from regulated services” increased to more than £1 billion in the last financial year. Apparently the Frontier report also shows that BT made returns of 70% from the regulated wholesale broadband services used by around 1.8 million customers living in rural parts of the country, where it faces little or no network-based competition. Vodafone claims this means that rural customers, who make up 9.5% of UK premises, provided BT with average excess profits of £93.84 per customer per year. “We, along with broadband customers across the country, share Ofcom’s disappointment at BT’s performance and at its reluctance to undertake the transformation necessary to ensure the UK has the competitive fibre networks it needs for the future. We will analyse the detail of what Ofcom proposes – and BT’s response to those details – very carefully. Just a comment from Fluidata (FluidOne). “FluidOne support the Ofcom’s announcement. This proposal combined with the recently pledged government funding appear to be a step in the right direction to support Britain maintaining its position as a leading digital economy and working to deliver universal access to good internet speed. BT appear to be evolving into a content based organisation with an increased focus on TV and Media operations, it seems to make sense at this stage to separate the long term infrastructure investment Openreach, from the retail and media investment model. Allowing Openreach to take a long term strategic approach to infrastructure investment in the UK should allow for the further development of an independent, competitive Openreach which is good for Britain, good for consumers and good in the fight to reach the final 10%. Bad news for us all. First Maggie bans BT from running fibre to protect VM’s investment, now Ofcom effectively stop openreach from sweating their well laid copper assets. Europe has more fibre because their copper access net was so poor. Our well laid copper network is axton superior, catering for 96% of a never envisioned future use case. This decision will come to bite all of us hard in the near future. Also it’s clear ofcom have little clue about the technology and industry they regulate. Great. Openreach will be sunk by final salary pension commitments for engineers, as there is a massive pension hole that is now theirs. They will just stop all investment. Ofcom worship some “competition” sacred cow, but it’s all a mirage, we have loads of people reselling the same crap. VM will likely stop or slow rollout now. I’m not sure which is worse for UK broadband, this, or the “double all your network hardware so we can log it all” law. The BT pension scheme has 300,000 members but only 30,000 or 10% are active members ( current employees) – they are a relatively small cost and easy to attribute to each business. The problem BT faces is with the 90% of deferreds and pensioners. If the the company was split I suspect a lot, particularly those with higher pensions, would get assigned to ‘core BT’ – so ‘core BT’ would pick up a large pension burden and loose the handy revenue stream from Openreach (currently helping to fund their TV efforts). No wonder they see a problem in splitting the pension fund. Whilst the allocation of pension liabilities will probably only benefit the legal profession I would think that a good proportion of the deferred and pensioners worked in activities now owned by Openreach, so at a top level might expect the alternative argument that the pension liability would now fall with Openreach not “core-BT”. I suspect Gadget that you would like that even less. If all these pension liabilities were dumped on BTOR then the mega pension deficit resulting would have to be made up from somewhere. ….and that somewhere would be line rental costs rising significantly. Most of those deferred pensioners will have worked on the core network business. Back in the days of Strowger switches (which were the great majority at the time of privatisation), there were huge numbers involved. Not just in the engineering and technical work but lots of ancillary support staff. Also, there will be a considerable proportion of those that worked at Martlesham on R&D. Then there will be a share of the all the overhead staff too. Back in the early 80s there really wasn’t much else but the phone and voice service. In any event, it’s a job for accountants to sort out the liability split but there will have to be some basis. But if anybody is expecting there to be a huge amount of cash suddenly released then I think they have a surprise coming. nb. there will still have to be dividend contributions too. BT isn’t going to lose the profits from Openreach, rather they’ll be paid as a dividend to BT Group. In fact if they get the right people at the helm, there is a lot of savings and profit to be made here rather than just plodding along. Some efficiencies will be lost as part of group separation, but they could be made up for by getting permission to dump legacy services (like ADSL on lines which already have sufficient VDSL capacity, old leased lines which can be emulated over Etherways, etc). OFCOM is likely to be in a giving mood if Openreach is properly separated. The question of pensions is an interesting one, like a lot of big companies in the 1990’s BT had a pension scheme with a healthy surplus and took “pension contribution holidays” diverting what it would have paid into the pension into the rest of the Group. Unfortunately now the market has gone the other way and firms are having to makeup pension deficits some companies feel this should only be a one way relationship. For BT the issue is probably going to be moot for now because Openreach will not be fully separated but merely a wholly owned subsidiary. A most bizarre decision. If the principle here is networks should be legally separate from retail activities, why no ruling on Virgin media? Or KCOM? Or altnets? The Offcom argument seems to essentially break down to… OR has put a lot of money into fibre, this has benefitted BT, therefore is anti-competitive, therefore we will legally separate OR, that way we will ensure there is more fibre investment. A more twisted argument, you could not find. OR will now have less incentive to invest in fibre. Pension liabilities will fall on OR cash flow. A string of highly paid, and highly remunerated executives will now need to be brought in, further denting available cash. Group functions will need to be replicated (HR, Legal, IT, etc). I think believe is led by a for former civil servant. What do you expect? This could potentially be good news. The infrastructure can now be run more like the national utility and near monopoly that is is with a view to re-nationalisation in the future. BT OpenReach have no one to blame but themselves for how this situation has come to pass. The government now need to put significant investment into this essential national infrastructure so that every home and business who wishes to can have access to high speed Internet access. That’s what I thought. It sets this up nicely. “re-nationalisation” is that a good idea? do we really want the government to have control of this service as well? remind us all how much underinvesting they are doing with the little things like NHS, welfare, Police, Fire, ect. Lets not beat around the bush here the government caused this problem in the first place and now you want to give them back full control? first thing they will do is put a “customer” fibre tax on everything so while they try to make everyone else roll out fibre by cutting costs they will get that money back off the end user and fibre for rural areas will NEVER happen. It depends on what you mean by “control” and “service”. So far as I can see, this is a stepping-stone towards complete separation. That being necessary to attain an end-goal of a company that can pull investment from multiple sources. This half-way house isn’t going to attract that investment and it will eventually need to be pushed all the way, but it’s a start. Which multiple sources do you see investment coming from? Until it is completely separated, none. This is simply the first step in that direction. And if/when separated, who do you see the multiple investment sources as being? You want me to come up with a list of potential investors? Clearly, absolutely nobody would be interested in buying into a company with a product which has huge growth potential and to which, in some shape or form, much of the country already subscribes to. There is no huge potential growth for fibre. There simply isn’t sufficient demand for the premium required to pay for it when all the evidence is that the great majority of consumer’s requirements are met by hybrid solutions (whether DOCSIS or FTTC). Yes, there are some requirements which aren’t met, yes there are some parts of the country where speeds fall far short of what’s usually available in urban areas. However, those fragmented areas are expensive to cover and generally are not commercially viable on wholesale rates. The existing copper and hybrid assets are what are called a “sunk cost”. As long as they pay their marginal costs, they will keep operating and provide a floor cost which fibre will have trouble competing with. Yes, there’s new builds, FTTB and some places where vertically integrated operations (with access to the full revenue stream) can make a case. But that’s not OR’s regulatory position where it has to provide a wholesale service which is tightly priced regulated and which is compelled to offer national pricing which doesn’t reflect local costs. The reason why there is not some form of national strategy for a full upgrade is the regulatory regime that Ofcom impose which minimises the price of copper through their guarantees to LLU operations. It has the perverse effect of embedding the copper infrastructure further, especially as they show no sign whatsoever of permitting any withdrawal of he MPF products. ROI could be many years, 20,30+ probably much more, in some rural areas you may never see a ROI due to the upfront expense. To deliver the oft-quoted 300Mbps G.Fast, fibre is going to need to reach street level. With FTTP, to the premises, with G.Fast’s limitations while it doesn’t have to penetrate so far, we’re still talking about two or more G.Fast nodes in a street to get that near to properties. The scale of that is staggering. The well-trodden path is to deploy on a cabinet basis, crow about “up to” speeds almost nobody can get, and then leave this until the modern performance is so atrociously embarrassing that the taxpayer pays to extend it. How does this legal separation alter that? Separately, maybe it wasn’t such a good idea to hold out the begging bowl, row back on promises, manipulate local authorities, and then willingly surrender shares to buy a mobile operator. Slap to government face delivered, now slapped back. couldn’t agree more with the last bit. Always we are told nothing is possible, the cost per household price is just too damn high. We can’t have FTTP. BT have always done the smoke and mirrors tactic of offering something and then saying it isn’t possible. Remember the article from them saying by 2012 something like 50% of the nation would be FTTP. In actual fact it was more like 0.5%. BT core should take the pensions burdens, but if they don’t and want to play hard ball, the government should do the same and then once Openreach fail as a result of no funding to cover anything, then re-nationalise it. Too long have we had to be at the mercy of BT and their smoke and mirrors promises. They rolled out FTTC 6 years ago and we are still on the same speeds. At that time Virgin Media was supplying 50mbit and now they are providing a 330mbit package. You had decades to shape up or ship out BT. Now its time to ship out. It is a bit odd. Ofcom could easily do a ‘true up’ of the BDUK work of its own and help get the most from the £292m capital deferral, determine the location of BT’s matched investment (£358m) and at least this would inform further decisions on the pace of FTTP, WLA 2017 cost recovery and the USO for Broadband. I notice PAC Wales were assured of 85,000 FTTP connections and FTTP on demand for all, the latter needs to become the native FTTP variety. This is a fraction of what is possible if the existing funds are actively managed and we get a little more transparency or reconciliation. Resource to do the work required is the principal issue and this must be more of an issue that any break-up. Ofcom have nothing to do with the management of the BDUK financing. Link please and details of any further discussions. So you believe the funding and business case is there for every single property (for all) in Wales to be covered by FTTP? Note the claim by BT is not actually valid until it is ‘affordable’. Some work to do, but the promise is clear if not how it is delivered. And BT capital will be examined in the future. @Steve Indeed, but unless the capital contribution becomes clear and transparent, they will do. Isle of Wight is a good example. It would be more productive that what they are proposing. This looks like their version of Brexit, no outcome, no objective, no cost, just some sentiment. Would it not be better to sell off BT retail/Plusnet owing to the conflict of interest. Openreach to not have a presence in N.Ireland so how would a possible split work for BT Ireland? Openreach are the incumbent in Northern Ireland. BT Ireland refers to the operation in Eire, which is using Eircom assets, not Openreach network. It would be entirely unaffected by this. So in the future when we are out of the EU who do they go to then? Why does Openreach not exist in Northern Ireland? Following Ofcom’s Strategic Review of Telecoms (2005), BT agreed to a series of ‘Undertakings’ designed to allow competitors to offer products and services to their customers over BT’s local access network – the wires and fibres that connect homes and businesses to local telephone exchanges. Part of the Undertakings involved a structural change to the BT Group which established Openreach as a separate business within BT to manage the local access network across the UK. However, owing to the relatively small size of BT’s business in Northern Ireland the structural change was not introduced in Northern Ireland and as a result Openreach does not have an operational presence in Northern Ireland. Instead, BT Ireland operates and maintains the Northern Ireland network on behalf of BT Group. All other elements of the Undertakings, however, apply in Northern Ireland. It has indeed been proposed by others that if anything be split off, it should be the BT Retail ISP. Then let them pay for the football from their own customer base. They do. BT Consumer profitable on its own merits. Any more lies you care to spread? What lies did the man say, Steve? There was an implication there but no out and out lies. I agree with him; separating BT Consumer and Business would be a way better idea than messing with Openreach. The lie is that BT Consumer customers aren’t paying for BT Sport and that it’s being subsidised by OpenReach. That trope is repeated endlessly without any evidence. BT Consumer is profitable in its own right, and people can raise valid arguments that the competition between Retail ISPs for control of content is undesirable, but that’s what is happening. For good or bad, BT Consumer have decided they need to do this to maintain market share. As long as its done within BT Consumer’s commercial envelope and isn’t being run at a loss, subsidised by OR, then it surely isn’t an issue. People can hardly demand that profits made by BT Consumer should be ploughed into network infrastructure when that’s not part of OR’s revenue stream. OfCom needs to be pressurised into making regular statements about how their bizarre plans are going to improve our prospects of getting widespread fibre (in the true sense of the word), getting rid of the non-upgradeable, non-future-proof maintenance nightmare that is our current copper first mile (well, 4.6 miles in my case). It would be better to be spending money on upgrading the network rather than masses of wasteful activity running around trying to continually keep mending the estate faster than it breaks, a bit like spinning plates. This is NOT a full structural separation. Therefore, in the short term, no big changes are to be expected. In particular, though Openreach is now allowed to develop its own strategy and annual operating plans, it still has to be within an overall budget limit set by BT Group. IMHO a small step in the right direction, but by far not enough! Openreach will have to be structurally separated from BT in the long term. It needs full access to financial markets and/or new investors, but this is only possible when the right framework for this exists, with needed investment securities for investors. Also, the pension burden needs to be sorted out, allocating them according to historical employment patterns might not be the right approach, the work areas and pattern already have or will rapidly change as technology evolves. Historical employment patterns are the only justifiable basis on which to allocate pension debts, especially when a split is forced from outside. Those are liabilities which arise from historical activities and they therefore belong with that part of the business which would have employed them. Not structural no as I said before they didn’t agree on separation ofcom wants legal separation bt obviously don’t so ofcom now force it. I’m sure things won’t be that simple though, where have you read about bt setting openreach budget? The pension liabilities are being presented as much more an obstacle than they need to be. All that is needed is an agreement on the current funding levels that takes into account the plan for reducing the pension deficit. That does not require a multi million pound hit to Openreach’s Balance Sheet just an increase in their annual contributions. Of course “all” it needs is an appropriate contribution to the pension scheme. The first difficulty will be setting the level of that contribution (there are already different opinions evident here, but historical employment patterns must surely be the way forward. However, the statement that it won’t affect the balance sheet of OR isn’t the issue. What it will most certainly do is impact the OR’s free cash flow, which is the amount of money it has to make investments and pay dividends. The level of those pension deficit contributions is therefore critical as it directly impacts on investment plans. I should also add it directly affects OR’s ability to finance any borrowings as well. With a set-up such as Ofcom appear to be proposing, there would also be an issue about how much of the current interest debt would accrue to OR. At the moment that is not accounted for in OR’s figures. When Cellnet was owned by BT (both when in partnership with Securicor and. later, when wholly owned), they borrowed money off of BT Group (who could borrow cheaper) and paid BT Group for the facility. That might continue with this arrangement. I don’t think OR under Ofcom’s settlement would have free range to borrow whatever it liked. There will have to be a budget setting exercise. It would be perverse indeed to have a wholly owner subsidiary with no financial oversight from the owner. In this case there is no need to split BTs pension fund in two. 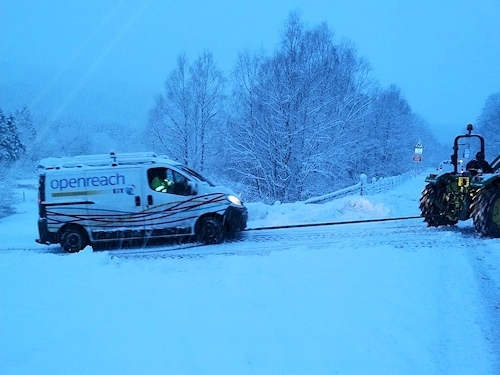 It can continue to service both Openreach and the remainder of BT. So yes there will be an impact on Openreachs cash flow but only if it has not been paying a contribution level that recognises the pension scheme is in deficit. Note that (unlike the regulators for some utilities), Ofcom explicitly does not allow for the inclusion of any historic pension deficit liability costs in regulated prices. There are also suggestions that the pension fund trustees are going to insist on higher rates or payment towards the pension deficit due to perceived increased risks (as Ofcom have noted in their consultation). The pension trustees have to sign off any plans to fund the deficit. @Steve Jones: I think you’re making a big problem out of nothing. BT has not yet been structurally separated. If you already have nightmares over BT, or over its pension burdens, as seems to be evident from your constantly defending the status quo of BT, then why don’t get rid of your BT shares and relax! Or use another telecom company for your business line! Nobody feels sorry for your “Can’t be done” attitude. I look forward to ISPs queuing up their announcements of investment in this legally separate company to enable the sorts of products they want to offer their customers to be deployed. I can’t see anyone buying into it until it is completely separated. That “big stick” will continue to be waved to see if BT will invest into the network or not. This is the first “lash” of the whip. That said, it does look as though BT may be able to avoid this if it acts. The objectively written piece entitled “Today is more disruptive on UK telecoms than the original BT privatisation” on the independent Think Broadband website amuses too. Honestly, the cries of “Now there won’t be any investment by BT” fall so hollow now. OFCOM haven’t fallen for it as we can clearly see. If they would get a move on and finalise this, and if, simultaneously the government didn’t have such sheer hatred of the concept of private investment in broadband (see BDUK programme, guaranteeing minimal private investment from day one and still now) maybe we could move forward with getting some kind of national network that could get the money (capitalisation) that it sorely needs. So if there’s no new investment DTMark (which TT/Voda keep harping on about), this just strikes of meddling? Excellent news, couldn’t have been better, although having a complete divorce would have been best. BT and OpenReach drag their heals sooo much and really treat their competitors customers poorley this was bound to happen. No doubt it’ll be frowned upon in this site, but the bigger picture is better faster and cheaper services we would never have got otherwise. BT have been taking the pee for years and years, billions of tax payers money given from local Councils, which rather then investing in a full Fibre network they pocketed for profit and half provided a Fibre network, now it’s slapped them hard. I’m hopeful their will be further punishment for failures by OpenReach too now, if they fail to connect a phone line for months on end their should be harsh penalties. Ya. Can’t help but note a contradiction there. That ignoring the utter nonsense that comprises the rest of the post in question. Starting as you mean to go on, with nonsense. Wasnt that the brief tho from the councils….. we want max coverage for the money. no matter which way you twist it you either have lots of people who can get “up to 80meg” on fttc or you can have maby 10% of that number on fttp but who are still only taking a 80meg package. you know my brother only gets 35meg fttc due to line length but with dsl he could only get 2meg. is he complaining? is he hell because hes only paying £2 a month more for 17 times the speed he was getting. in a ideal world everyone would have fttp yes, but who is going to pay for it? lets say they give you fttp tomorrow, will you pay the £80 (wholesale) price for go for the much cheaper 80meg thus making your whole argument a complete waste of time! Whatever; the customers will pay, like they always do. Many of them wouldn’t mind if only genuine fibre was available to them. I suspect a lot only care about the functionality at the cost they are prepared to pay, rather than the medium that delivers it. @GN – the vast majority want a service, not a method of delivery. And pay the minimum. Well it is about time Ofcom grew some balls. Lets hope they go through with it now. I though BT was a private company? BT has invested heavily in fibre while the competitors have not. BT invested in fibre because they saw a profitable business in it. in it rather than now effectively stealing the business from the investors who have paid for it. I don’t know anyone with BT infinity who are unhappy with it and I have enjoyed high speeds and excellent service for years. Focusing on unprofitable rural areas as reasons to break up BT is ludicrous – this is a business not a charity. do is compete for the already established profitable BT high speed networks and leaving BT to meet demand the unprofitable areas. The only real complaints I know of is that of sky, talk talk and virgin where service has been abysmal. Would you like a tissue to go with the tears and spilt milk?